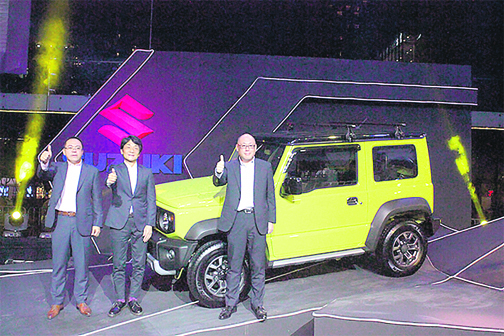 Friday, March 8 saw the reveal of the newest generation of Suzuki’s iconic 4x4 SUV at Bonifacio High Street Amphitheater in BGC Taguig, the Suzuki Jimny All-Grip Pro. Suzuki Philippines president Hiroshi Suzuki, SPH Director and Automobile Division General Manager Keiichi Suzuki and SPH Managing Director and Treasurer Norminio Mojica led guests, mediamen and enthusiasts in making the event a standout. The Jimny All-Grip Pro was showcased during the event, with guests given the free rein to tinker with the runabout vehicle known for its durability and superior off-road capabilities. The Jimny was designed for the roughest of terrains and forests, to support the driver and sate his thirst for adventure. “Our determination to provide simple, straightforward, and functional vehicles such as the Suzuki Jimny All-Grip Pro underscores our commitment to continuously provide innovation that Filipinos can rely on. Every detail of the fourth-generation Jimny—from the body to the engine—is designed to deliver the maximum performance and durability required by serious off-road travellers. With this newest addition to our line-up of vehicles, more Filipinos can now enjoy the Suzuki Way of Life! as they explore more challenges and adventures,” Keiichi Suzuki said. It’s square body and compact dimensions make the Jimny perfect for long trips, lending itself to better situational awareness and higher maneuverability in narrow trails and thick forests. It’s built to accommodate 53 liters more luggage than the previous models. The Jimny has a ladder frame and a long-stroke 3-link suspension and rigid full wheel axles on front and rear for stronger traction and better resistance on uneven terrain. Its 37-degree specialized approach angle, 28-degree ramp break over angle and 49-degree departure angle assures that the Jimny can climb over steep hills and various obstacles without scraping its bumpers or underbody. Each of the Jimny variants is equipped with Suzuki’s Total Effective Control Technology (TECT) that distributes the collision energy across the vehicle frame to reduce the damage to the car and the passengers. To add to the newly improved Jimny specifications, Suzuki increased the SUV’s ladder frame rigidity and its body mount was calibrated to decrease vibrations reducing the driver’s stress and fatigue while travelling. The Jimny also used zinc-coated steel and was given a more effective floor undercoating and seater coatings at panel edges to prevent it from having rust due to the salt from river crossing. Prices of the Jimny All-Grip Pro range from P 975,000 for GL MT; P1, 035,000 for GL AT; P1, 085,000 for GLX AT Monotone, a to P 1, 095, 000 for GLX AT Two Tone. Buyers can choose from various color: Solid Kinetic Yellow, Metallic Brisk Blue, and Metallic Chiffon Ivory, or Monotone variant: Pearl Bluish Black, Solid Medium Gray, Metallic Silky Silver, Superior White, and Solid Jungle Garden.